“Power Line Autumn Vistas” picture courtesy of Flickr Creative Commons, taken by Don O’Brien on Oct. 21, 2007. Big jobs need big solutions. And we deliver. Our track record of work with companies and contractors on big jobs proves it. 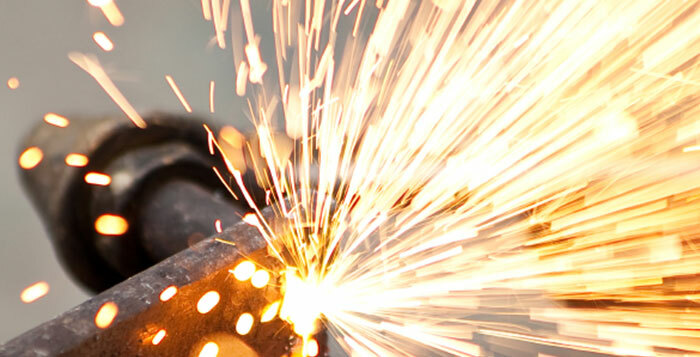 We have deep experience handling a variety of metal materials big and small, and our crews have the knowledge, skills and tools to tackle any job. Ameren came to us with a big job, and we handled it. Here’s how. Ameren knows energy. It’s what they do. They handle power like it’s nobody’s business. As a premier supplier of energy, they take pride in making sure that everyone in the Alton area gets power reliably and consistently. When Ameren needed to do maintenance work in Hartford, Ill., they had to do it in as little time as possible and as inexpensively as possible. That’s where we at AltonMaterials came in. Ameren is upgrading a multitude of towers that house power lines integral to delivering consistent and reliable power. New structures mounted on stronger, more storm-resistant concrete bases are replacing old ones in order to limit power outages and ensure safety. Ameren’s electricians disconnected power and used a crane to lay down the 150-foot tall towers in Hartford, Ill. Then, we went to work. We cut up the towers and disposed of them efficiently. After Ameren laid them on the ground whole, we brought in equipment and an expert torch crew that cut the towers into manageable, 25-foot pieces, loaded them onto our flatbed trailers, and hauled them back to our yard. With us quickly moving metal out of Ameren’s way, they were able to efficiently construct new towers and restore power to the area. When it was all said and done, we paid Ameren. Our crews, tools and expertise allowed Ameren to get money for their unwieldy scrap metal and recoup some of the cost of upgrading their towers. Results echo louder than promises. Ameren has an important job for its customers, and we take that seriously. They had to cut off power to the area immediately surrounding the towers in Hartford, Ill., leaving residents in the dark. But we helped Ameren get power back ahead of schedule. In fact, it only took us two days to complete our scrap metal removal, and Ameren had expected the job to take a week. We completed our work in less than half the time Ameren expected us to do so, and the residents of Hartford, Ill. got their power back early. When we come to a job site, we’re there to work quickly and move metal out of your way so you can do your job. Contractors, demolishers and big companies alike can benefit from our experience. Once they’re on the job site, our crews have the knowledge and tools to make a plan of action and execute it quickly. With close to 20 years of experience, they craft unique plans for each job right on the job site, and our experienced site supervisors always supply equipment and the personnel in a timely manner. When it’s all said and done, we’ll pay you a competitive price for your scrap metal and save you time in the process. Got a big scrap metal problem? No worries, we’ve got a big scrap metal solution tailor-made for you. Click below to set up a free consultation and say goodbye to your scrap management problem.